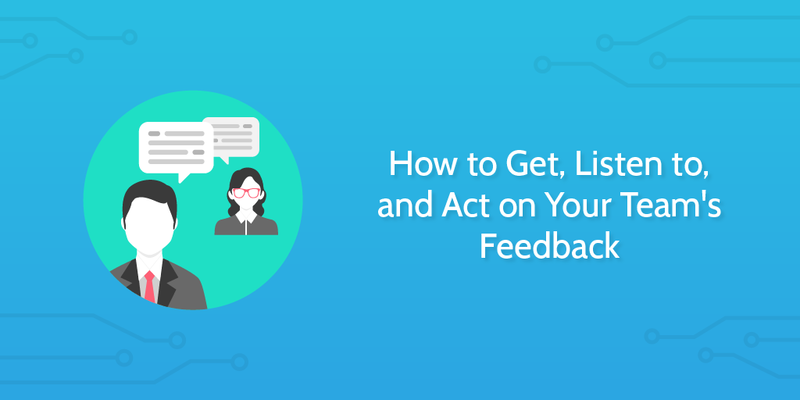 So, to help you make the most of your employees as people with their own opinions, rather than mindless work robots, we’re going to dive into how to encourage, listen to, process, and act on employee feedback. You can’t listen to or learn from employee feedback if your team isn’t willing to give you any, and so the first step is to encourage it as a practice. In some ways this is the most difficult part of setting up or improving your feedback cycle, since you’re asking your team to develop a new habit and go out of their comfort zone to speak up on issues they notice. If open communication isn’t already a key part of your company culture, this barrier alone will prove difficult to overcome. First things first; if you want to encourage your team to give meaningful feedback, you need to make sure that they’re familiar enough with each other to speak up and highlight problems. The best way to do this is to take care of introductions as early as possible during employee onboarding. Although employee onboarding is utterly crucial in many aspects, even I’ll admit that we’ve covered the various benefits, methods, and even specific checklists in detail in other posts. As such, I won’t give an exhaustive rundown here. Next up, you need to have a clear policy on how your employees can leave feedback for you, and to make sure that it allows everyone to contribute. It’s no good asking for feedback if someone feels too pressured to speak up during team meetings. It could be that you have a suggestion box or another anonymous source for leaving comments. Alternatively, you might have set open office hours where team members can drop by for a chat about whatever’s on their mind. Heck, you could even just have a whiteboard and pen set up in a communal space to let people write their thoughts for all to see. All of these have pros and cons, but the point is that without the opportunity to speak, your team won’t tell you how to improve or what’s bugging them. For example, anonymous suggestions are great for those who are more self-conscious during meetings, but it’s equally easy to abuse that system by throwing in a bunch of the same comments. As such, you might want to take any feedback with a grain of salt and question any overwhelming feedback. Meanwhile, having a policy of bringing up problems during your work meetings is a great way to make sure that your team knows exactly how everyone feels about a topic. This helps encourage the sense of community which can help employees feel more satisfied, get help easily, and in general work more efficiently. While they don’t have to be daily standups, having a regular meeting schedule is great for letting your team collect their thoughts and give meaningful feedback at predictable times. Rather than having a messy feedback loop where comments can be submitted at any time and easily lost, you can just add a feedback session to your usual meeting. Not only that, but having a set feedback time during your meetings means that employees can ask for help before they need it (or at least let the team know when they might need to reach out for advice). 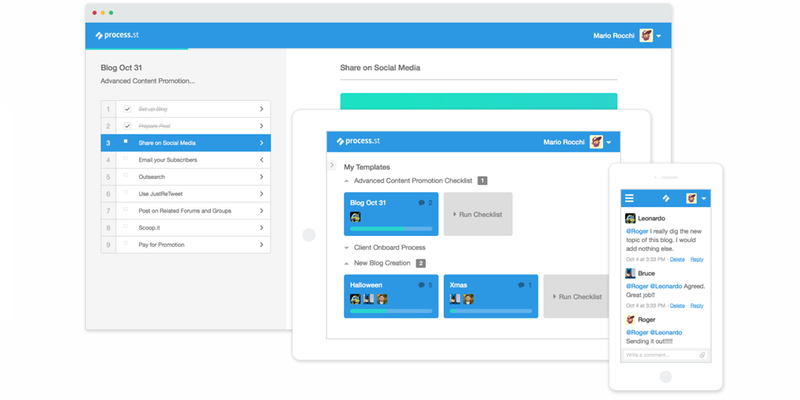 This will let your entire team plan their task lists more effectively and support each other when needed. The frequency of your meetings doesn’t matter too much, but aiming to host at least one a week should be plenty to avoid clashing with your teams’ schedules and still give everyone a chance to speak their mind. For example, in the Process Street content team we have four meetings every week, with two each on Tuesdays and Thursdays (morning and evening). Of those sessions, half contain our CEO Vinay Patankar, and half are just internal team sessions. We’ll usually spend five or so minutes chatting and catching up to break the ice, but after that we follow a set structure to make sure that everyone presents their work, gets others to weigh in on their progress, and also gives feedback about anything they want. What did you do since our last meeting? What does everything think of their work? What are your tasks until our next meeting? Is there anything else you need from the team or would like to suggest? That really is everything to it! As for tools for remote teams to use when conducting meetings, from personal experience I’d recommend Zoom. It’s free, easy to use, has a nice interface, and remembers your common meeting rooms to let you rejoin quickly. However, for a full rundown and comparison, check out our post about the best video conferencing apps. What do you do about employees who need a little push to say what they think, but are too timid to speak up in front of their whole team? You book monthly one-on-one sessions between them and their manager, that’s what. These meetings are a fantastic way to both gather feedback and give your team members the individual attention needed to make them feel appreciated. Not only that, but you can take the opportunity to talk directly to specific employees and help to prompt them on any issues which you’ve seen cropping up. If you’ve noticed that someone has been struggling to hit their deadlines (or has missed them entirely), these one-on-one meetings are a great time to talk to them without potentially embarrassing them in front of the rest of their team. Nobody likes having their mistakes pointed out, but by doing it in a more private setting you can take some of the sting out of the blow and get to the root of the problem. On that note, you should be careful not to go too overboard with your probing. Give them an opportunity to voice their thoughts, but make sure you’re not speaking down to them or being overly negative or aggressive. Doing that will only make them want to either clam up further or get defensive, which are both equally bad for encouraging useful employee feedback. Encouraging your employees to speak up is all well and good, but if they don’t feel like you’re listening to them then they simply won’t bother. Equally, if they feel like you’re engaged in the conversation then they’ll be more likely to field comments of their own accord, rather than needing you to prompt them. You can’t just ask for feedback and then go silent – you need to make the extra effort to really listen to what’s being said, and to show your team that that’s exactly what you’re doing. Even outside of gathering feedback this isn’t something you can afford to ignore, as 80% of employees would work more hours for a more empathetic employer. By showing some real interest and indicating that their feedback is being listened to, you’re both increasing employee loyalty and making them want to go the extra mile in their work. Enough chatter though; let’s get to it. If a team member keeps getting interrupted or ignored they’re going to be annoyed. If they don’t feel like they have the time to speak then they simply won’t, or will end up interrupting and talking down other people in order to get a word in. Either way, the person being interrupted will end up resenting the situation (and maybe even the person interrupting them), so it’s vital that you nip this problem in the bud. The easiest way to do this is to make sure that everyone has a specific time to speak up and voice their opinions during your meetings. This lets the focus turn to them and limits the desire for others to speak up at the same time, since they also have a set block where they can talk to their heart’s content. As a quick side note, you don’t have to have set slots for your meetings (eg, Mark presents his items and feedback first, Sally second, Peter third, and so on). This can make your team feel pushed down if they’re always left until last especially if you end up running over and they have to be cut short by the end of the meeting. Rotating rosters are far from a bad idea, as this lets your team know in advance who will be presenting at what point in the meeting, and thus they can prepare beforehand. For example, if someone is the last person to present their achievements and feedback during a meeting, they should maybe prepare a condensed version in case the meeting starts to run over schedule and needs to be called short. It’s simple, it’s easy, but by making a conscious effort to look directly at a person when they’re talking, you’re using a powerful method to encourage them to continue. You’re showing them (even subconsciously) that you’re paying attention and not just giving lip service to the idea of letting them provide feedback. Heck, it also forces you to actually listen to what the other person is saying and take more of it on board. It’s harder to get distracted if you’re actively trying to pay attention to them. That might sound a little harsh or negligent (you should always be paying attention to someone who’s talking to you), but there will inevitably be times when something else is on your mind. Maybe you had one too many coffees that morning and the shakes are setting in, or maybe you have personal circumstances drawing your attention away. Either way, it’s only human to get distracted. However, no matter what the cause is, you can’t afford to let these distractions get in the way of listening to your employees. If you do, they will stop reaching out and giving you the feedback you need to keep improving your business for everyone (including your team). Obviously, this isn’t possible if you’re meeting with someone over the phone – you can’t stare at them through the receiver. That’s why it’s vital to try and arrange video calls for when physical meetings aren’t possible. Being able to see the person you’re talking to does more than just let you pay attention to them. It helps grow familiarity between you and your team and lets them see you as a person they can reach out to, rather than an unfeeling name in their communication app. I’ve already mentioned how important it is to avoid pushing too much when you’re looking for feedback or trying to get to the root of a problem. The best way to do this is to aim to be clear and encouraging when you speak, rather than overly critical for the sake of it. Every interaction with your team is an opportunity to either get some meaningful feedback and grow a more solid connection or to push them away that little bit more. Clarity and encouragement are key to preventing that. Be clear about what you expect from your team from the outset and then they will be able to provide useful comments on the level of work involved and whether your deadlines were fair. Having a clearly defined performance review, promotion, benefits and holiday policies will do the same. Encouragement is especially vital when concerning projects that have failed or when deadlines have been missed, as taking too much of a hardline approach will push away any and all team members involved. However, that doesn’t mean you should completely avoid bringing up these things – you need to get to the bottom of what caused these issues in order to prevent them happening again. Be clear and encouraging, but fair and helpful. So, your employees are both willing to offer their feedback and you’re able to listen to it effectively. That’s great, but unless your team sees that action is being taken off the back of those comments, they’ll eventually stop offering them. Even if nothing actually changes, they need to know that you’ve heard them and have discussed how to deal with the issues they field. To do this, however, you need to take the time to document and categorize your feedback in some way to make sure that you don’t forget or lose it. After that you need to assess each comment, prioritize it, and then organize any action you’re going to take. If you don’t store, document, or categorize the feedback you receive you’re going to lose it forever and discourage future comments. You might as well have not put the effort into encouraging it in the first place. Your system for doing this doesn’t have to be anything fancy; much like when you’re documenting your processes for the first time, what matters is that you have a set system that’s followed, as you can always improve that system later. If you wanted to get a little more involved with your feedback categorization, you could always use the Jobs-To-Be-Done framework to create categories which show you how common each complaint or desire is. I won’t go fully into what JTBD is (that’s an entire post unto itself), but I will provide an overview to get you started. JTBD runs on the idea that people buy products to get jobs done. While that sounds simple, it completely shifts the way we think about the improvements we need to make and the direction we’re going in. Rather than saying “how can we improve the product/team/technology/task”, you should instead be asking “what job is being done, and how can we better reach the end result”. This lets you group statements by the job that they’re attempting to get done, rather than having a mess of semi-organized folders and different definitions for the same thing. After all, when each “job” can summarize 50 – 150 different statements, you’re suddenly left with a much clearer picture of what your team wants, and how many people want it. In an ideal world, you’d be able to find a happy medium which suits everyone. All problems would be resolved and nobody would have cause to complain. Unfortunately, whether due to conflicting interests, large negative implications, or simply a lack of time and resources, you can’t solve every problem, and you need to pick your battles very carefully to spend time fixing what matters the most (and is possible). Just because you’ve encouraged, listened to, documented, and categorized your team’s feedback doesn’t mean that you have to act on it. Some issues (especially grievances between two people rather than a task, process, or project) will be impossible to resolve while remaining impartial. You might be able to mention the issue to the people involved and get the ball rolling, but if you start to take sides (unless someone’s violating company policy or the like) you’ll just alienate your employees. Aside from that, it’s important to assess the feedback you receive to determine how important the issue is, how urgent it is, a rough estimation of the time and resources needed to take action on it, and the effects of changing whatever has been brought up. Once you’ve put together a rough priority list you’ll also need to cross-reference that with your own goals as a manager and in terms of the business as a whole. While it’s not always pleasant, you’re ultimately running a business, and sometimes you’ll have to be firm and just say “no”. Once you’ve decided which issues are worth tackling (and what priority they should have), you need to sort the tasks into your plans. While this isn’t a direct part of the employee feedback process, by doing this you’re essentially rounding off the practice and showing that you’ll take action where possible. As mentioned earlier, this will further encourage your employees to leave more feedback, which will allow you to start the whole process over again. Not to mention that taking action will let employees know that you value their input, and will hopefully convey a little ownership of the changes to them. No matter what happens as a result of their feedback, you need to let your employees know exactly what’s been done about it. Whether their comments have resulted in action being taken or not, you should at least acknowledge that you’ve taken their words on board and they haven’t wasted their time. You won’t always have the time, resources, or suitable reason to act on the feedback your team gives you, but by showing that you’re listening to and assessing the comments you’re receiving they’ll know that, even if their every problem isn’t solved, you’ve heard them and have assessed what to do about it. Plus, if you get feedback for a task that’s impractical to carry out or just isn’t going to be worked on, there’s no reason why you can’t take a moment to talk to the employee (if known) in a group or private meeting and explain why that decision has been reached. It all comes down to making your employees know that their time and opinions are respected, both through words and actions. Employee feedback policies and cycles are difficult to get right, and like any process it’ll require continuous improvement in order to make the most of it. However, with these tips you should be well on your way to having a useful program that your team wants to contribute towards. Going beyond that, if you don’t already have a set method for collecting and organizing customer feedback, a similar system can be used. In fact, this is where the JTBD model truly shines, as it allows you to boil down the feedback from hundreds of customers into a set few jobs which need completing, rather than getting lost making minor (and largely useless) tweaks to your product. For now, encourage your team to speak up and highlight the issues they see – you’d be surprised at how much you can miss when mistakes become normal practice and a fresh pair of eyes looks everything over. How do you encourage, collect, and organize your employee feedback? I’d love to hear from you in the comments below! Do you have suggestions for dealing with negative feedback with regards to other employees? Gossip and complaining are issues that are always interesting to deal with. Thanks! I’m impressed, I must say. Really not often do I encounter a blog that’s both educative and entertaining, and let me inform you, you’ve gotten hit the nail on the head. Your thought is outstanding; the difficulty is something that not enough people are talking intelligently about. I am very glad that I stumbled across this in my search for one thing relating to this.